Like New. Used-Like New. Ships from UK in 48 hours or less (usually same day). Your purchase helps support the African Children's Educational Trust (A-CET). 100% money back guarantee. We are a world class secondhand bookstore based in Hertfordshire, United Kingdom and specialize in high quality textbooks across an enormous variety of subjects. We aim to provide a vast range of textbooks, rare and collectible books at a great price. Through our work with A-CET we have helped give hundreds of young people in Africa the vital chance to get an education. We provide a 100% money back guarantee and are dedicated to providing our customers with the highest standards of service in the bookselling industry. Very Good. 0393329429 ALL BOOKS SHIPPED WITHIN 1 DAY OF PURCHASE! Good. This is a soft cover book. It may have a minor bump or bruise. Minor cover or page wear/markings may be present as signs of previous use. Any additional materials( access codes/ CD, tables, charts, cards, letters, etc. ) are NOT promised to be included. The pages are slightly stained or discolored, but not excessive. There may be creases or discoloration on the binding/spine of the book. Fast Shipping Monday through Friday-Safe and Secure! Please verify your shipping address at time of purchase to ensure delivery. Very Good. "Wolke is Martha Stewart with a PhD. "-American Scientist. Trade paperback (US). Glued binding. 350 p. Contains: Line drawings, black & white, Charts. 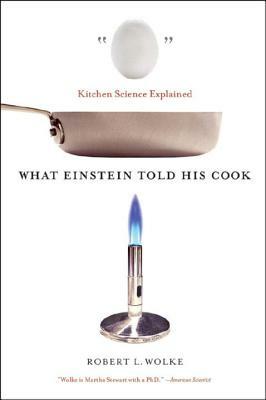 by James A Peterson, Ph.D.
What Einstein Told His Cook: Kitchen Science Explained is great in explaining why and why nots in the kitchen; is entertaining while seriously giving great tips and the recipes are top notch. It's a fantastic in a fantastic book. These two books (Einstein 1 and 2) are just wonderful resources for those of us who have wondered about some cooking "truths". Is Kosher salt more or less salty? Is it better in some way? Does baking soda remove odors from your fridge? These books are great reading and I recommend them ahead of Harold McGee. Does searing your pot roast "seal in" the juices? NO! But, you should do it anyway, for the taste.